Who would go to a baseball game with fireworks after, the night before leaving vey early on a Great American Solar Eclipse trip? A busy family that had to squeeze in a family night on the only available night this month. Our local Reno Aces (AAA Arizona Diamondbacks) were playing the Sacramento River Cats (AAA San Francisco Giants). Andy’s allegiance was torn between the local beloved Aces and the AAA team for our beloved Giants. We were seated on the home plate side of the Aces dugout. Andy went down there at the end of the game and asked if he could get a bat. He got one that was in the trash – he said the player tapped it on the ground and gave it to him and said it’s not broken. When we examined it later, it had two rectangular dings in it. Baseballs don’t make rectangular dings, so we realized this bat had probably been used to hit something in the dugout in anger. Andy with his prize bat. The best souvenirs are free. My camera was still focused for fireworks, hence the blurry photo. When we got home, Andy said, ‘That was fun!” We all had fun! It turns out that fireworks were the perfect prelude to a truly amazing trip. Andy had to stay home for school, Cross Country practice and orchestra commitments. Our friends Erika, Paul, and Maddie from Eldorado Hills, California picked us up for the road trip to Idaho. We stopped for lunch at The Griddle in Winnemucca, where I ate breakfast every day when I was in Winnemucca for work 20 some odd years ago. Memories! We didn’t yet realize that epic was the perfect word to describe our trip too. When we got closer to Idaho, Erika, who grew up there, was amazed to to see a steady line of cars going north on a road where cars are usually few and far between. We arrived at Erika’s parent’s beautiful home in Parma, Idaho, in time for dinner, which included fresh sweet corn picked right out the back door. After dinner we relaxed on their patio. John and Thien arrived from Granite Bay, California after exploring Boise and having dinner there. Maddie hung out inside, writing. A girl after my own heart. Bill’s brother, who lives down the road, had gone to the family cabin for the Eclipse, so Pat and Bill went down the road to sleep so Stan and I could have their Master bedroom. This was incredibly kind of them. But Bill was back the next morning, making huckleberry pancakes. Thien and John had recently returned from New Zealand where their son Alex is spending a semester. While there, Thien found the butter she grew up with in Viet Nam. She said when she was a kid she didn’t know the butter was from New Zealand. She brought home 8 cans. After breakfast, Bill, who was born and raised in Parma, took the guys on a scouting tour to pick out our viewing site for the total eclipse. Maddie helped her grandmother in the kitchen. After the guys got back, they worked on their eclipse viewing mechanisms. Perfecting the projection screen.”We found the corona!”, notice the beer bottle. 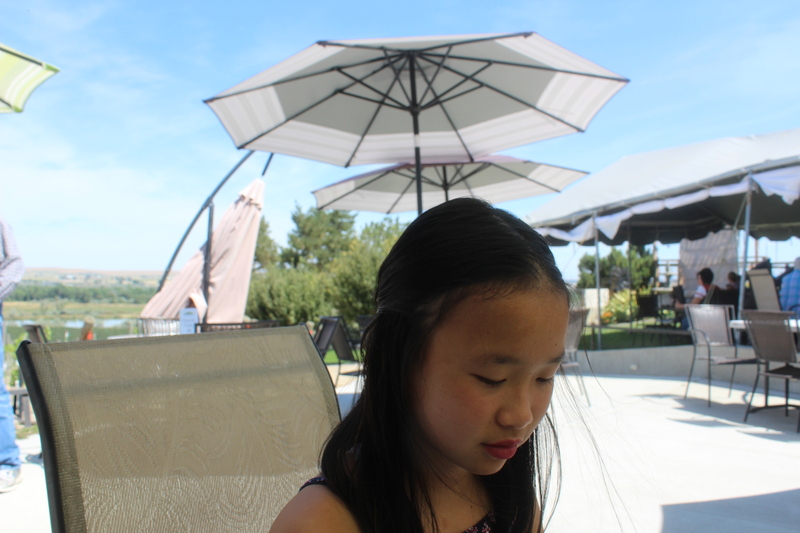 Then we went for a great Sunday lunch at the Parma Ridge Winery. We played musical chairs so we could talk with others in the group. I had been next to Maddie, conversing with her. Stan asked what was going on over there and this was my response: Maddie and I were whispering. Thanks Erika, for the beautiful wine glasses to remind us of a wonderful trip with friends we love! After lunch, Bill took us on a tour of the Parma farming areas. This area grows crops for seeds to sell. This would be considered an abandoned field in Nevada, but here it is a field full of alfalfa seeds ready to be harvested next month. The sheds are for leaf cutter beehives. Hops is a major crop in the area. Bill teaching us all about hops. Stan was so hoppy! He loves hoppy beer. When we got home, Erika saw in her news feed that Neil DeGraase Tyson looked for the place most likeley to have clear skies for viewing the total eclipse snd the best ice cream, and he was spotted in Boise ice cream shops. That made us feel good about our location. The next day was the Great American Solar Eclipse. We left at 6 a.m. to try to beat the crowds. Traffic was light. We drove many miles on a dirt road to Paddock Valley Reservoir. This turned out to be the perfect viewing spot. It was beautiful. There was a group camping on the beach so we went to the boat ramp. We had a few hours before the event to get set up. There was even a bathroom! A few other people trickled in, including a high school astronomy and geology teacher. Everyone in our area was from nearby in Idaho. Erika knew some of the families from growing up in Parma. It was a far cry from the masses of humanity I was expecting, and that’s a good thing. Our group, sans Maddie in the car, ready for the show. The projection screen attracted lots of interest. I set my camera on auto on a tripod and captured different moments of the moon’s passage. I am glad the projection screen was in my photos. 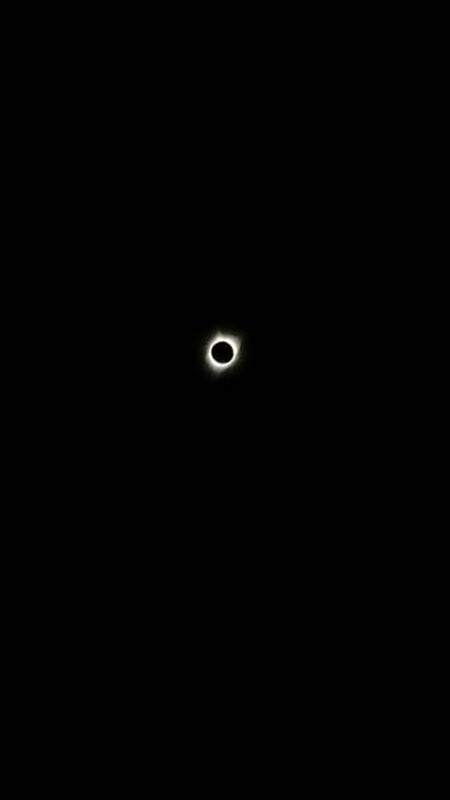 The two minutes of totality can’t be described by words or photos. I will try, but you really need to go find your own total eclipse to fully understand. Google future total eclipses and plan it. I predicted that I would be the only silent one during totality. since I can’t speak. A guy came by and asked John if he was the smartest guy in the group. He said, “I am pretty smart, but when I have questions, I ask him,” pointing at Stan. The guy then appointed Stan captain of the parking lot with the job of telling everyone when they could take their glasses off. So then totality. Two unbelievable minutes. I was not quiet. I squealed and was giddy. John had goosebumps. The cows stopped mooing. First I will share some photos of the show in the sky. My auto exposed (long exposure) photo doesn’t give you the true light level. We could see light to the north and the south but the sky in the shadow was dark. It actually looked like late twilight. When the sun came out from behind the moon, we were all high-fiving each other, as if we had achieved a victory. Stan said it was the best day in his nerd life since the first man on the moon. Most people left soon after totality, but the dad with the two boys went fishing. We hung around a little longer. Then we drove back to the Gotsch home via back roads, passing over the I84 freeway that was bumper to bumper. We made it back to the farm after the eclipse and had an adrenaline letdown. I was totally pampered by Maddie who gave me a pedicure. And then the long drive home on Tuesday. This time John and Thien caravaned with us, and we stayed in radio contact. We all ate lunch at The Griddle. In Winnemucca, we passed the giant Idaho potato. Erika was so excited she called her dad. She had never seen it before. We had the perfect setup – Paul driving with Stan in shotgun seat, Erika and I in the back seat, and Maddie in the way back, watching movies or sleeping. Stan and Paul kept a conversation going between them, which left Erika and I to have a “whispered” Boogie Board conversation. It was a girlfriend pow wow and it was awesome. It could not have been a nicer trip, thanks to the Gotschs, the Peters, and the Russells, and of course the sun and the moon. It was wonderful trip with people we love. What a beautiful description of your epic eclipse adventure! Bob and I traveled to a winery in Salem with our daughter and her husband to view the stunning event while my dear sister and her husband graciously and lovingly cared for my mother…..it was a stunning event….I’m so happy you and Stan witnessed it too! Thanks Meg, for sharing your experience and your great eclipse photos with us. I’m glad you had such a fun trip. I enjoy reading your blogs and I think it’s really neat that you share your journeys with us. Keeping you all in my thoughts and prayers.